﻿READ THIS PAGE ENTIRELY ​BEFORE ENROLLING﻿. ​You will be able to enroll at the bottom of this page. 2. Then, file your Certification or Re-Certification documents. IMPORTANT NOTE REGARDING FEES: The cost for the Refresher Course is $150.00. (NYC and Overseas prices may vary.) If you are "Inactive" you must pay the Refresher registration fee AND prepay your certification or re-certification fees, plus any late fees. Your fees for the Refresher courses are fully refundable for up to 3-days prior to the class. Non-attendance is not a valid reason for a refund. COURTESY EXTENSION: Once you have enrolled in your Refresher Course and have prepaid all fees, you will be given a Courtesy Extension. This will grant you "ACTIVE" privileges for a limited time, enabling you to complete your requirements for reinstatement. 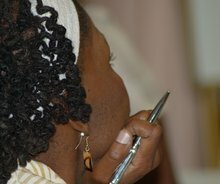 OPTION TWO: Complete your Refresher requirement online through the Sisterlocks Online Academy. (What is this?) This option is not recommended for anyone needing hands-on coaching or practice. See if this option is right for you by going to the Sisterlocks Online Academy (No need to login) and under "Courses" select "Online Refresher Prep and Enroll." Online Refresher classes are offered monthly for your convenience. CLICK HERE TO SELECT THIS OPTION. OPTION THREE: Take an Advanced Refresher Class. These classes are offered infrequently throughout the year. This is a way to get a comprehensive review of the basic Sisterlock elements in a relatively short amount of time. This is possible because the class only admits previously-trained Consultants and Trainees, so it can be self--paced and based on the on the needs of individual attendees. The class runs from two to two-and-a-half hours long.